© Text and photos Tom Chaffin. 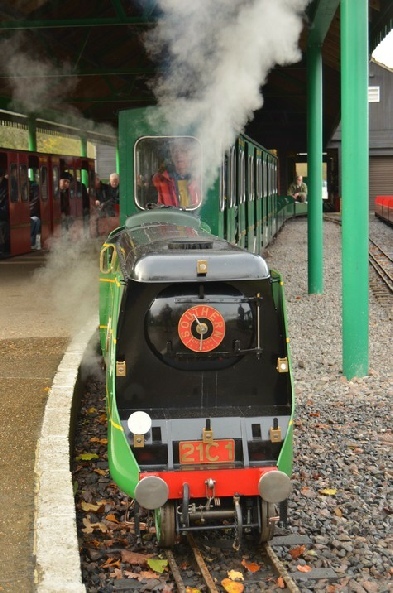 A joint visit by the Locomotive & Carriage Institution and the Preserved Locomotive Enthusiasts Group (PLEG) was arranged to the dual gauge 10" and 7" Eastleigh Lakeside Steam Railway on Thursday 1st December 2011. 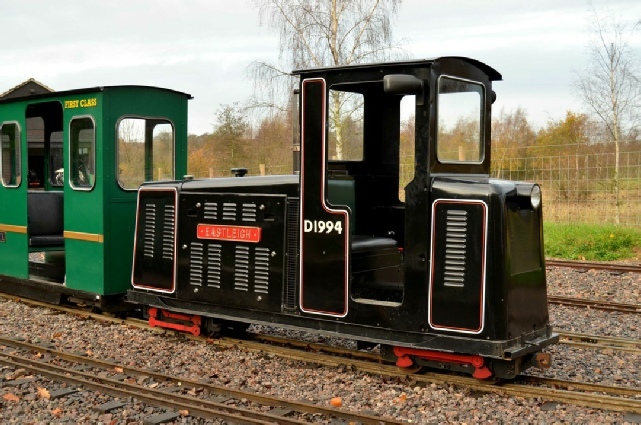 For those not familiar with PLEG, their aim is to allow their members to ride behind the rarer UK preserved diesel and electric locomotives on lines around Britain. Many of the members also aim to travel on as many sections of track as possible. 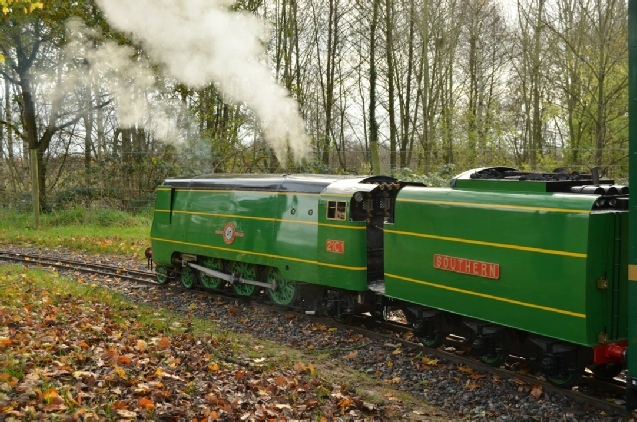 Virtually all of the Eastleigh Lakeside Railway was traversed during this visit. 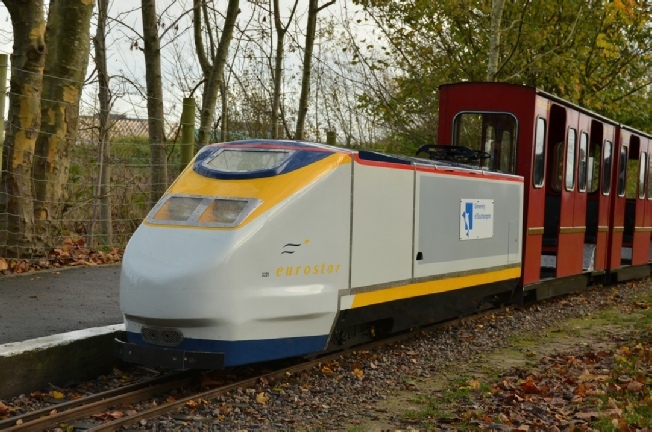 Due to the size of the group, two trains were required to transport everyone around the railway. Eurostar 3221 and Merchant Navy 21C1 Channel Packet await departure from Eastleigh Parkway station at the start of the visit. Our steam locomotive for the day was 21C1, a 10 1/4" replica of unrebuilt O.V.S. Bullied, Merchant Navy Channel Packet. 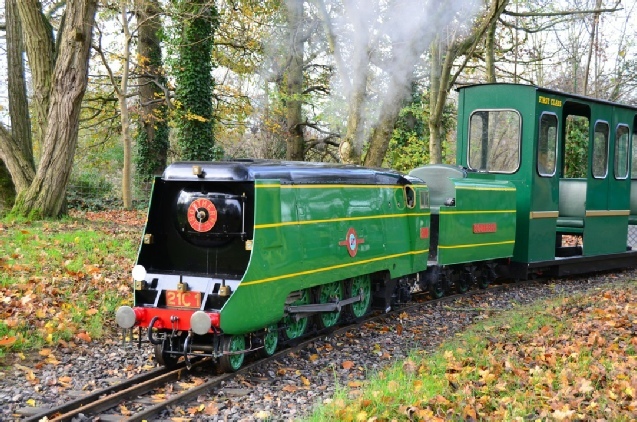 This impressive coal-fired model was built in 2011 by Jesse Moody and is believed to be the only 3 cylinder 10 1/4 inch Merchant Navy anywhere in the World. 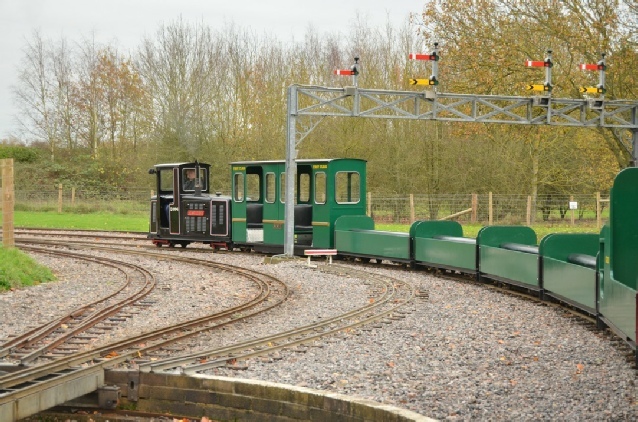 Each train did a number of different circuits of the railway, covering different lines and crossovers each time. This also provided an opportunity for passengers on one train to take photos of the other train as they passed. Here 3221 Eurostar travels along the lower 'Up Line' after going through the tunnel. There are two parallel tracks leaving Eastleigh Parkway which gave an opportunity for the two trains to depart at the same time. The 3221 Eurostar departs on the Bypass line on the left whilst 21C1 Channel Packet departs on the "Departure Line" on the right. 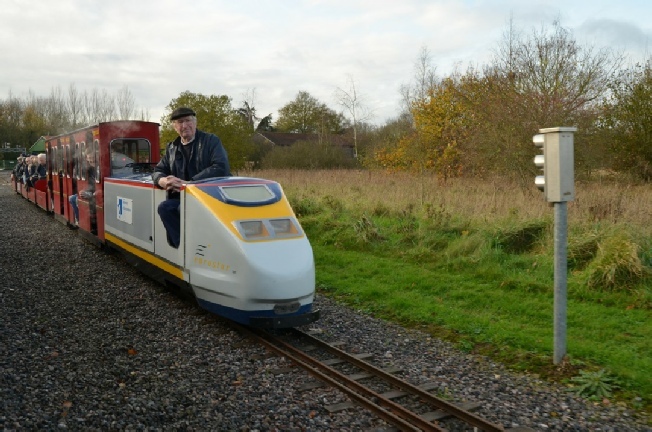 Shortly afterwards, the Eurostar was held at signal EL19 as it waited to go over the the crossovers onto the Down Line, giving a photo-opportunity for 21C1's passengers as they passed in front. 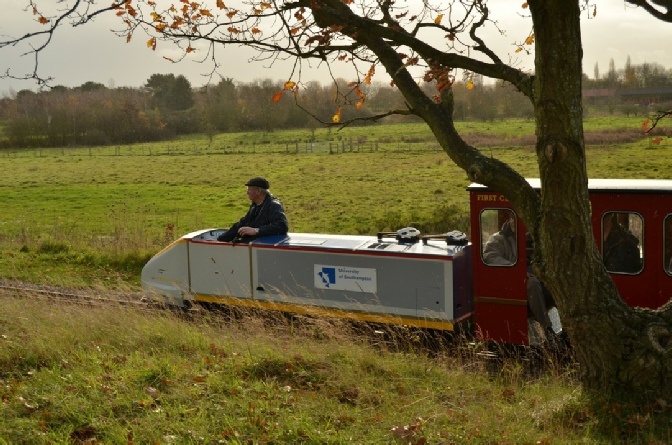 At the far end of the line, the trains go round the Monks Brook Loop. 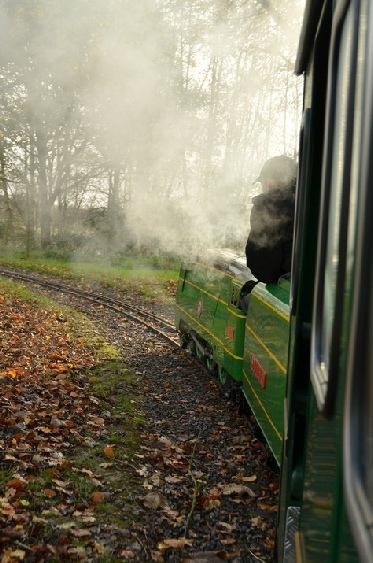 On most journeys along the line each train has a short stop whilst on the loop allowing steam to be raised and the passengers a stretch of the legs. Here 21C1 blows-off waiting to restart the train amongst the autumn leaves. And 21C1 again, from the front - looking very much a miniature Bullied Pacific. Note the large size of the carriages in relation to the engine and the dual-gauge track. Across the loop 3221 Eurostar pauses at Monks Brook Halt. The propulsion system for this battery-powered engine was designed by three master's degree students at Southampton University in 1997. On one of the trips 21C1 started to slip with its heavy train after restarting up the hill on Monks Brook Loop. 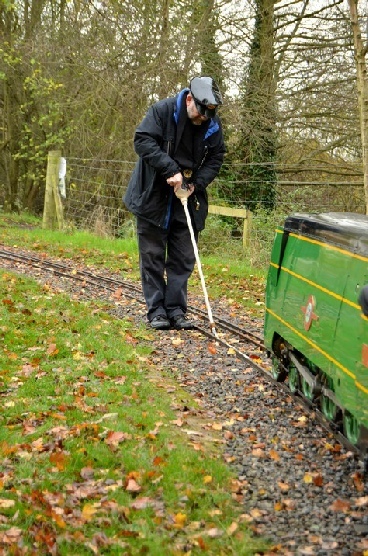 After setting back down the gradient, sand was applied on the rails by the guard using a special home-made applicator! After numerous trips around the mainline, the group than transferred to a 16 carriage train hauled by diesel engine D1994 so as to cover the various lines adjacent to Eastleigh Parkway station. This incredibly powerful engine was built in 1994. Here D1994 pushes its mammoth train under Eastleigh Parkway's impressive signal gantry onto a line connecting to the engine shed adjacent to the station platforms. 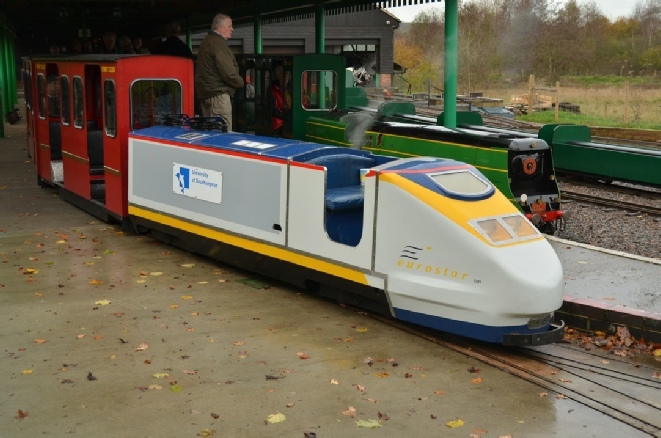 As many of the passengers wanted to ride over each section of track, the passengers tended to be concentrated at the far end of the train, hence the empty carriages. In this photo the carriages were passing over Eastleigh Parkway's turntable, a rather unusual location to be as a passenger on a train!. 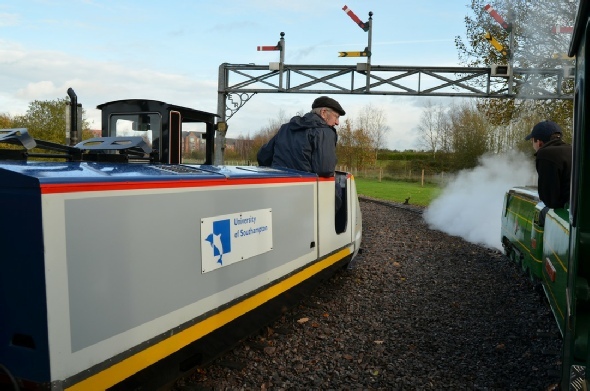 On behalf of the Locomotive and Carriage Institution and the Preserved Locomotive Enthusiasts Group we would like to give our thanks to the staff of the Eastleigh Lakeside Steam Railway for a most enjoyable morning. 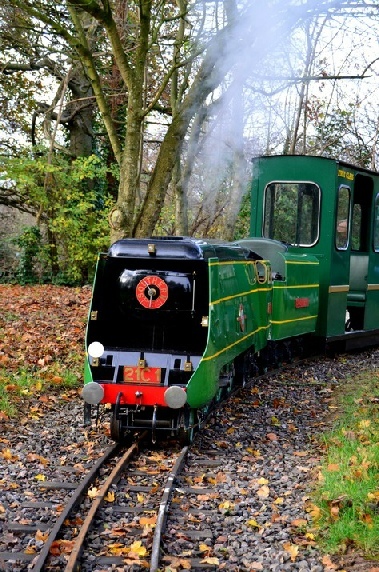 If you missed this visit, but after seeing these pictures fancy a visit to the Eastleigh Lakeside Steam Railway, it is strongly recommended. 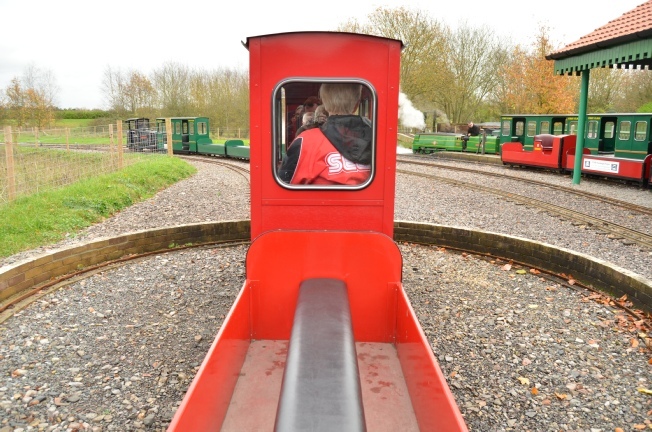 The railway is open every weekend throughout the year as well as during school holidays. It is a short ten minute walk from Southampton Airport Parkway station and is just off the A335 to Eastleigh, reached from junction 5 of the M27.